Over 6 billion tonnes of coal are currently produced annually worldwide. The top five coal producers are China, the USA, India, Australia and South Africa. We have become used to worrying about ‘peak oil’ (the time when oil starts to rapidly run out) and we describe fossil fuels as a ‘finite’ resource. However, in February 2015, scientists reported that trillions of dollars’ worth of coal, oil and gas are available but should not be extracted if the global temperature rise is to be kept under the 2 degrees centigrade (2°C) safety limit agreed by leaders of the world’s nations. If the scientists are correct, and if the politicians keep their word on the 2 oC limit, then energy companies could be wasting their time and money in seeking out new, more expensive oil and gas sources. In 2013, fossil fuel companies spent over £400 billion on exploration. This means, in effect, that unless some new technology is discovered to remove carbon emissions from coal when it is used, there is no future for coal mining. Many scientists say that coal should be the first fossil fuel industry to have its remaining reserves simply left underground. Some politicians are still sceptical of the science of climate change and claim that policies like that of abandoning fossil fuels would be bad for business, making energy unaffordable, affecting costs, and making industries uncompetitive. Others argue that the predicted effects of global warming, such as extreme weather events, droughts and flooding, would be even worse for business. However, it is still not clear whether the 2°C target can be achieved unless aircraft can find a new means of propulsion, all cars are run on electricity and coal fired power stations are urgently replaced by something else that will ‘keep the lights on’. There is no longer any significant deep mining in the UK, but there are numerous opencast sites operating. However, even if coal mining were stopped tomorrow, there would still be a legacy of environmental problems. Opencast mines use massive machines to strip the earth’s surface to reach coal seams below. They can cover many square kilometres and typically have a life span of 20 years or more after which full restoration of the affected area should take place. However, according to a recent parliamentary debate, there are over 50 ex-opencast sites around the UK, many of which are important wildlife areas, where restoration has not happened, as the planning conditions have not been adequately enforced and the industry has not absorbed the costs of environmental damage. Economists suggest that privatisation reduces government failure but increases market failure. However, in the case of opencast, these are occurring together. When the coal industry was privatised in the 1990s opencast operators were not required by law to put an adequate amount of money into independently managed restoration funds – a failure of regulation. Many companies have been using an unsustainable business model, relying on planning permission for a new opencast coaling scheme to pay for the restoration of a previous scheme. The collapse of prices on international coal markets has helped to create an environmental disaster. Q.1. Using Extract A, calculate, to two decimal places, the UK’s coal consumption as a percentage of China’s, and identify one other significant feature of the data shown. Thus, UK’s coal consumption is 1.87% of China’s coal consumption. Another significant feature of the data given is that UK energy consumption of all fuel types is very less in comparison to other countries. And, Russia use negligible amount of green renewables like solar, tidal, wind etc. in comparison to other countries. Russia’s green renewables consumption is 0.16% of US, 0.9% of UK and 0.23% of China which is vey less. Q.2. Explain what is meant by a “finite” resource’ (Extract B) and analyze why it might be argued that environmental policies are ‘bad for business’ (Extract B). Answer: A finite resource is a non-renewable resource and will be deplete if it is continued to be used in large amounts. As discussed, coal is a finite resource because it is extracted in large amounts in due course of time then it will extinguish. This type of resources is formed at a rate very slower than the rate of consumption. Environment protection laws or policies require the businesses to protect the environment i.e. they need a proper waste disposal system, proper management of emissions, sustainable development of raw materials etc. All these simply raise the costs of businesses which in some form get reflected in form of higher product prices and at the other end, consumers face higher prices are consumer surplus decreases and these higher costs decrease the profit margins of the firms. Q.3. ‘In tackling environmental problems there is not really a straight choice between perfectly performing markets on the one hand, and wonderfully wise governments on the other.’ (Extract C). Using the data and your knowledge of economics, assess the relative importance of market forces and government intervention in encouraging businesses to behave responsibly towards the environment. Answer: Market structures and its effects on environment are correlated. When it comes to environmental policies or investment in environmental R&D or similar incentives, market structures determine them. The firms are profit-driven; thus, they do not care of the environmental damage due to the production process. This happens because natural resources are plentiful and are taken for granted leading to underpricing and undervaluation of these resources. Also, environmental quality is rarely traded in the markets and it does not have observable market prices too. Therefore, special techniques are required for such valuation and these are called as non-market valuations which are people willingness to pay for the changes in environmental quality, this is implicit values of the environment. Therefore, markets cannot be relied upon fully to encourage the development of sustainable businesses because markets work on the profit motive and the incentive to start using renewable energy is less. Setting up of renewable energy is associated with huge capital costs and also, there is uncertainty about the future. Government support is very much important for the renewable resources market because privates sector won’t be able to do it alone. Government is necessary to facilitate smooth functioning and also, it provides financial aid. Fuel consumption is on a rise and on its way to depletion. Thus, efficient utilization of them is need of the hour. Markets allocate private goods efficiently but governmental intervention is usually required for the efficient allocation of public goods. Perhaps economists have traditionally had difficulty in discussing ‘fairness’, but during 2015 this topic was unavoidable as Greece, the UK, Spain and some other EU countries all had elections where equality, equity, tax avoidance, tax evasion, welfare, and the idea that the wealth of the highly paid can ‘trickle down’ to the low paid, were all critically discussed. 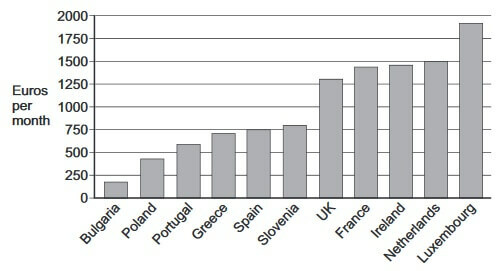 Several of the founding EU member states have a history of operating a national minimum wage (NMW). A number, including Ireland, the UK and many newer members, have only relatively recently introduced minimum wage legislation, while seven of the EU-28 states had no NMW as of July 2014. In recent years, there has been a pattern of relatively low wage increases in most European countries, and trade unions claim that purchasing power and standards of living have fallen. NMW levels are not necessarily changed every year, nor does any adjustment always result in an increase. For example, the level of minimum wages in Greece decreased in 2012 as part of the austerity measures introduced by the government of the day. Some commentators support the idea of an EU-wide ‘European minimum wage’. Extract F: What is the living wage? The living wage is an informal benchmark, not a legally enforceable minimum level of pay, like the national minimum wage. The NMW is set by the business secretary each year on the advice of the Low Pay Commission and is enforced by HM Revenue and Customs. The idea of a living wage is promoted by an independent body, the Living Wage Foundation. It has received widespread political support, but limited endorsement from employers. The living wage is based on the amount an individual needs to earn to cover the basic costs of living and lead a ‘decent life’. The living wage is now set at £9.15 an hour in London and £7.85 an hour in the rest of the UK. By comparison, since October 2014, the NMW has been £6.50 an hour for adults aged 21 and over, and £5.13 for those aged 18 to 20. Assuming a 40-hour week, average hourly earnings before tax for all full-time employees in April 2013 were £12.92. At present, only a little more than 1000 employers have signed up to paying the living wage. They include some FTSE 100 companies such as Aviva and Barclays, and some large local authorities such as Cardiff and Newcastle. Some supporters of better pay for the low paid argue that employers who pay their staff too little are in effect being subsidised by taxpayers, through top-up state benefits such as tax credits. However, some companies, especially smaller ones, argue that paying the living wage could lead to job losses, and others say that they have been hit by the financial crisis and so could not increase staff costs to this level. After the general election of 2015, the Chancellor of the Exchequer, George Osborne, announced that the Conservative government would create a ‘National Living Wage’ which would rise to £9 an hour by 2020. This would apply only to workers aged 25 and over and be accompanied by a reduction in benefits for people in work. Opinion was divided on whether low paid workers would be better or worse off as a result. Q.4. Using Extract D, Graph (i), calculate the Spanish minimum wage as a percentage of that of the Netherlands, and identify one significant point of comparison between information in Graph (i) and information in Graph (ii). Another significant point of comparison between the two graphs is that Slovenia and Spain have almost equal minimum wages. However, the percentage of working population receiving 105% or less of the minimum wage is highest for Slovenia i.e. almost as high as 20% whereas this percentage is lowest for Spain, almost negligible. This feature shows that Spain adheres to the minimum wage policy and Slovenia has poor labor laws and the working population is exploited. Q.5. Explain the difference between ‘equality’ and ‘equity’ (Extract E), and analyze why, left to market forces, some workers will earn very low wages. Answer: Equality means everyone is on the same level and there is equal sharing and equal division whereas equity represents fairness, justice, impartiality and equality of outcomes. Equity is mostly used in the ownership of shares. Equality describes quantity and equity describes quality. Market forces cannot function efficiently always for which some workers will earn low wages because there exist labor market imperfections, poor information, geographical immobility, growth in part time work which have lower wages, discrimination and globalization etc. All this factors in some way influence the competitiveness within the industry which affects the wages of the workers. Q.6. ‘The living wage is based on the amount an individual need to earn to cover the basic costs of living and lead a “decent life”.’ (Extract F). Using the data and your knowledge of economics, assess whether the UK government should legislate to make the national minimum wage a living wage, or whether there are better ways of improving the earning power of the low paid. Answer: Living wage is an hourly wage rate considered the minimum level to provide the basic essentials of modern living i.e. it is the amount an individual need to earn to cover the basic costs of living and lead a ‘decent life’. Both living and national minimum wage has their advantages and disadvantages. If the living wage would be implemented then this would have a deep effect on both income of low paid workers and firms because higher living wages will increase the costs of business and could lead to unemployment. Living wage will help in reducing inequality in society. The firms can afford higher wage rates for lowest paid workers by reducing wage rates of top paid workers generating equity. Also, higher wages will increase labor productivity, professionalism and motivation. When people will get their living wages, then poverty gaps would be reduced and the standard of living of the society as a whole increase. However, if setting up living wage much higher than the existing minimum wage rate then this could lead to unemployment and could increase the costs of the firms and make it difficult for their survival. Therefore, government should encourage voluntary uptake and benefits should be provided to the firms who pay higher wages. Therefore, after studying the working environment in UK carefully, government should take any course of action. Q.7. Explain how economic theory suggests that perfect competition among many small firms leads to an efficient allocation of resources. Answer: In case of small firms which in huge number, perfect competition can lead to efficient allocation of resources because there will be complete mobility of resources which gets reflected in the market prices. Perfect competition gives the freedom of entry and exit, complete information about the market players, homogenous products etc. and these help the small firms in achieving pareto- optimality. Because, when the market is dominant by monopolies, small firms are in a worse off position, therefore, through perfect competition, they can reach efficient allocation of resources. Q.8. Evaluate whether growing market concentration and monopoly power, in an industry such as motor manufacturing, are necessarily undesirable. Answer: In industry like motor manufacturing, monopoly power is undesirable because such monopolists will earn supernormal profits at the cost of efficiency and the consumer’s welfare will decline. The price is assumed to be higher than both marginal and average cost leading to allocative inefficiency and thus, the product will be under-consumed. Also, due to the lack of competition, these manufacturers will have less incentive to invest in research and development. Motor manufacturing is such an industry where innovation is very needful, and less incentive by the firms’ leads to use of those old methods of production and consumers are worse off. Q.9. Explain the difference between diminishing returns to a factor in the short run, and returns to scale in the long run. Answer: Diminishing returns to a factor in the short run are a phenomenon of increasing the factor while other production variables are constant whereas returns to scale in the long run happen when all the variables of production are increased. Diminishing returns to a factor occurs when the incremental output per unit decreases as there is an additional unit of the factor of production while other factors are kept constant. On the other hand, returns to scale is the proportion increase in all inputs resulting in increase in output. Diminishing return to a factor is a short run phenomenon because one factor is fixed and in the long run, all factors vary leading to returns to scale i.e. there is no distinction between fixed and variable factors. Diminishing returns to a factor is considered as the optimum stage whereas in returns to scale, there is no such thing. Q.10. Evaluate the view that, for all firms, whether small or large, in the long run, profit maximization is always more important than any other business objective. Answer: Profit maximization has been the sole objective of firms whether small or large in the long run because it gives higher dividends for shareholders, more profit helps in financing research and development, higher profit makes the firm less vulnerable to takeover and higher profit enables higher salaries for workers. Thus, it is considered good for all. Also, firms try to use it resources efficiently and though this they get higher profits despite of the consequences or the risk involved such as, it creates an environment where price is most important and cutting costs is the primary goal leading to a loss of goodwill with customers and suppliers. Profit maximization has always been a goal to all firms because it secures funds for expansion and growth of business. The conventional theory assumes that in a competitive market only those firms survive which are able to make profit because profit is considered to be the most efficient and reliable measure of the efficiency of a firm and profit can be used as a performance evaluation criterion and also, help to predict the behavior of the firms. Q.11. Explain why imperfect information might lead to market failure in the case of merit goods and demerit goods. Answer: Imperfect information is a situation where the parties involved in an economic transaction have different knowledge i.e. the buyers and sellers do not have the complete information. It happens because of uncertainty or ignorance. Imperfect information is generally caused by misunderstanding the true costs or benefits of a product, uncertainty about costs and benefits, complex information, inaccurate or misleading information, lack of awareness. Due to this imperfect information, market failure occurs because with limited information, buyers and sellers may not be able to transact and will make poor decisions. Merit goods are goods where people do not realize its true benefits i.e. the net private benefit (consumer surplus) to the consumer is not fully recognized at the time of consumption like education, healthcare etc. and there is significant information failure i.e. imperfect information in the market of merit goods which leads to under consumption of merit goods. People generally do not foresee the social benefits of the consumption of merit goods. The market failure in merit goods occur because of imperfect information about the private and the external benefits resulting from consumption of merit goods and also, there may be considerable time lags in deriving the benefit of a merit good. Demerit goods are the goods which have a negative impact upon the consumers and these damaging effects are generally ignored or are hidden to the consumers. Thus, demerit goods put negative externalities on third parties and mostly harmful to the consumers like consuming alcohol etc. This happens because people are irrational and make poor choices by consuming demerit goods due to lack of information or poor decision making. Thus, people tend to under-estimate the private costs and over-estimate the private benefits leading to market failure. Q.12. Discuss whether economic welfare would necessarily be increased if the provision of merit goods and public goods were always left to governments without ever involving markets. Answer: Markets tend to allocate private goods efficiently but governmental intervention is usually required for the efficient allocation of public goods and merit goods. Markets generally fail to remove externalities and thus, under-produce public or merit goods. Therefore, governments subsidize or provide goods with positive externalities so as to increase economic welfare. Firstly, in case of public goods like defense, law and order etc. have no fiscal incentive for the free market to provide such goods. The main problems are free-rider and valuation. In case of a free-rider problem, some people enjoy the benefit of a public good without paying their share of the cost. These riders cannot be prevented because public goods are non-excludable. Here people free ride on the efforts of others. The free-rider problem leads to under-provision of the good which thus results in market failure. Such problem can be solved through taxation or charging a user fee and the government can use the tax revenues for financing public services which will increase economic welfare. Secondly, merit goods like education and health care should be provided by the government so as to ensure that everyone has the opportunity to gain from these goods because they have a strong social benefit because free market provision of merit goods will lead to unequal and inconsistent distribution leading to market failure. There is no real model of a society run in the absence of government intervention because government is needed for our protection rights and expanding the national defense. Therefore, by weighing the costs and benefits, governmental intervention should take place and in the right amount.